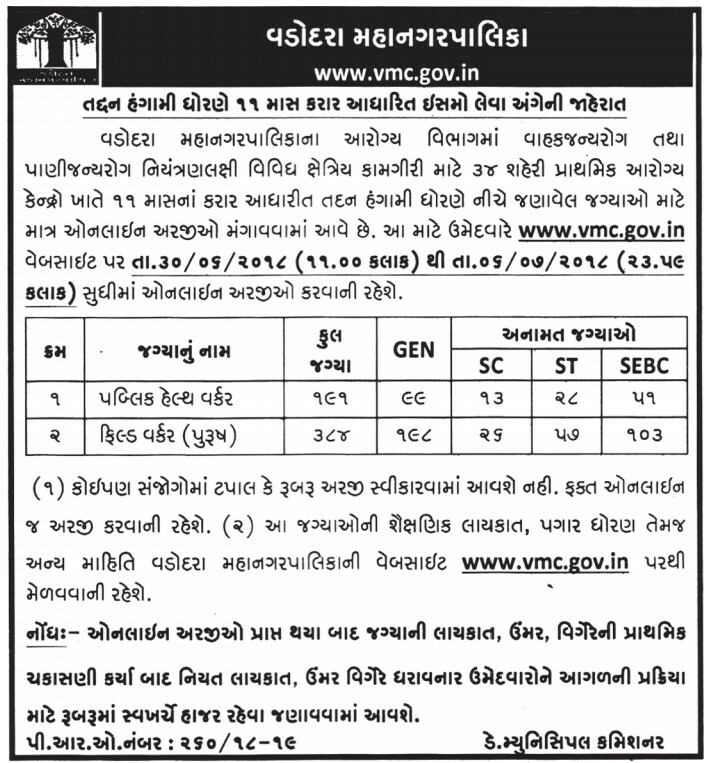 Vadodara Municipal Corporation Recruitment 2018: Vadodara Municipal Corporation shortly VMC recently published a job notification for recruiting the eligible candidates in the vacancy post of Medical Officer, Lab Technician, Female Health Worker, Staff Nurse & Other Posts. As per VMC Job Notification, It will recruit 575 vacancies for the above said posts. This is brilliant job opportunity for candidates who are seeking latest Govt jobs can use this opportunity of VMC Recruitment. Candidates must fill the online application form on or before the last date 06.07.2018. Interested and Eligible Candidates applying for VMC jobs can check the official notification. This Page explains detailed information on Vadodara Municipal Corporation Recruitment such as Eligibility Criteria, Age Limit and more. Candidates are requested to read following details carefully and apply online for Vadodara Municipal Corporation Recruitment 2018-2019.